In 2016, We the People sent a clear message to Washington DC that we were sick and tired of the status quo. To chants of “Drain the Swamp”, America put Donald Trump in the White House and gave him a GOP majority in Congress and the Senate. Their directive? Fix, reduce or eliminate job-killing over-regulation, energy dependence on foreign governments who hate our guts, anti-First Amendment political correctness, out of control spending exploding our national debt and deficits, porous borders allowing massive influx of drugs and illegals into our nation, sanctuary city policies releasing dangerous criminals into our communities, constant attacks on our Second Amendment rights, disrespect of and dishonor to our veterans by the VA, higher and more punitive taxes, even more restrictions on our religious liberty, and a military decimated by sequestration. Elimination of 22 job-killing regulations for every new one, facilitating the creation of 3 million jobs and the lowest unemployment rate in 18 years. $3.2 trillion gross tax cuts for families. Return of 17 Americans held overseas. Historic increase in defense funding and rebuilding of our nation’s military. Top corporate tax rate lowered from 35 percent to 21 percent making American business more competitive on the world stage. Consumer and business confidence is at an all-time high. Increased border control, enforcement of immigration laws, and start of construction on border wall. Funding of $4 billion to launch nation-wide effort to fight the opioid epidemic. Confirmation of the most circuit court judges of any president in their first year and the confirmation of Justice Neil Gorsuch to the Supreme Court. Signed legislation to ensure accountability to the Department of Veterans Affairs and choice in the care for our veterans. Over the past two years, the Left has doubled down on their collectivist ideology, pushing their agenda to fundamentally change America. In addition to the distraction caused by the baseless ‘Russian Collusion’ and ‘Obstruction of Justice’ illusions, their socialist agenda is to severely restrict or eliminate our right of self-protection as guaranteed to us by the Second Amendment, limit conservative freedom of speech and religious liberty, implement single payer government run health care, stack the Supreme Court with liberal justices, flood our nation with illegal aliens who depend on welfare and medicaid, and impeach the duly elected president of the United States! The mid-term elections of 2018 are as important as any election in this nation’s history. If America is to continue on the constitutional path of liberty, security, and prosperity as designed by our founders, it is imperative that we continue to drain the swamp and move our conservative agenda to the other side of the legislative process and the President’s desk for signature. This requires maintaining a healthy Republican majority in the House and increasing the Republican majority in the Senate. Through the legal and constitutional electoral process, both in the primary and the general elections, we must vote for and financially support candidates like Wendy Rogers in Arizona’s First Congressional District who will stand with President Trump to enact his agenda and protect our constitutional rights. Dr. Dan’s guest on Freedom Forum Radio this weekend is Ret. 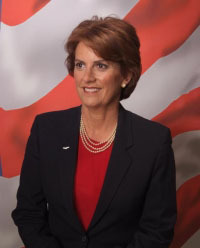 Lt Colonel Wendy Rogers, Republican candidate for US Congress in Arizona’s First Congressional District. Wendy Rogers is a strong voice for conservative values. She will stand with President Trump to Secure our Borders, Build the Wall, and Crack Down on Law Breakers. Wendy Rogers will vote to Defend Life, Our Values, and Religious Liberties. 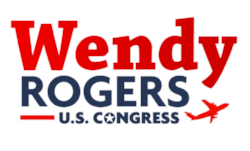 Finally, Wendy Rogers will vote for Fiscal Responsibility, to Repeal Obamacare, and to Unleash the Free Market to spur Job Creation and Economic Growth. HELP SEND WENDY ROGERS TO WASHINGTON TO STAND WITH PRESIDENT TRUMP. MAKE A FINANCIAL CONTRIBUTION TO HER CAMPAIGN BY CLICKING ON THE IMAGE BELOW. Part one of this two-part interview begins this weekend, Saturday and Sunday, July 7-8, on WJRB 95.1 FM and streamed live over the Internet. Part two airs Saturday and Sunday, July 14-15. All programs are available by podcast following air time here. War of coastal aggression and Drain the swamp are spot on… Absolutely outstanding. Sat down and read both to my wife who was equally impressed.